Coffee is one of the most widely consumed drinks in the world, with two billion cups drunk worldwide every day. Brewers from every continent have developed a legion of different methods to make the perfect cup, but few have ever put the question to science. South Indian coffee (a.k.a filter coffee) is a milk coffee (perfect example of South Indians' affinity for dairy products). It is a right mixture of decoction and milk added with sugar, primarily from coffee beans and chicory. There are multinationals too in the market !! In recent past, on every highway in Tamilnadu, shops calling themselves - original Kumbakonam filter coffee shops have mushroomed. In South Indian culture, the visitor to a House is welcomed and offered a tumbler of coffee. It is an energizer, many have the habit of taking a cup of coffee immediately after consuming their food, especially tiffin items. It is common to see people walking to restaurants / hotels and order only a cup of coffee. For most Indians, especially South Indians, the day begins with a coffee in the morning and perhaps at least two more during the day. At home, it is not simply Coffee, but Filter coffee ! The rich aroma of whole bean. The convenience (and truly excellent espresso shots) of Verismo® pods. 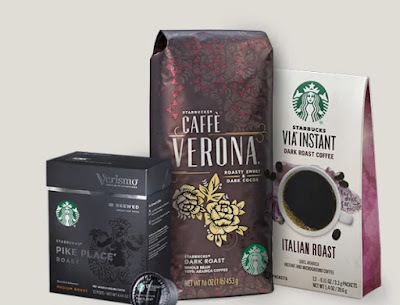 The go-anywhere-ness of Starbucks VIA® Instant ~ Our coffee is made to be taken home with you. Which is your favorite way to brew? - reads the website of Starbucks. Starbucks Corporation is an American coffee company and coffeehouse chain. Starbucks was founded in Seattle, Washington in 1971. As of 2017, the company operates 27,339 locations worldwide. Starbucks is considered the main representative of "second wave coffee", initially distinguishing itself from other coffee-serving venues in the US by taste, quality, and customer experience while popularizing darkly roasted coffee. Though it tried luring coffee drinkers with hand-made coffee based on lighter roasts, they use automated espresso machines also. Starbucks locations serve hot and cold drinks, whole-bean coffee, microground instant coffee known as VIA, espresso, caffe latte, and many other products. Many stores sell pre-packaged food items, hot and cold sandwiches, and drinkware including mugs and tumblers. Now a Court ruling shakes them – other coffee sellers and users .. Starbucks and other coffee vendors must carry cancer warnings in California, a Los Angeles judge has ruled. The companies have less than a fortnight to challenge the decision and could face millions of pounds in fines if unsuccessful. The decision relates to a chemical called acrylamide, a byproduct of roasting coffee beans that is present in high levels in brewed coffee. In California, companies are required by law to warn consumers if their products contain chemicals that could cause cancer. A non-profit group claimed acrylamide was in that category and brought a lawsuit against some 90 coffee retailers including Starbucks. Elihu Berle, a Los Angeles Superior Court Judge, ruled that the companies had failed to show there was no significant risk from a carcinogen produced in the roasting process. The judge said: “Defendants failed to satisfy their burden of proving by a preponderance of evidence that consumption of coffee confers a benefit to human health.” The lawsuit was filed in 2010 by the Council for Education and Research on Toxics (CERT). It calls for fines as large as $2,500 per person for every exposure to the chemical since 2002 at the defendants’ shops in California. Given the state has a population of nearly 40 million any fines, which would be decided in a later stage of the trial, could be huge. Starbucks, Dunkin’ Donuts, McDonald’s and other coffee retailers did not comment on the decision according to Reuters, which reported the news. A statement from the National Coffee Association (NCA) read: “Cancer warning labels on coffee would be misleading. The US government’s own dietary guidelines state that coffee can be part of a healthy lifestyle.” So the ruling of the Californian judge is stipulating that coffee companies across the state will have to carry a cancer warning label because of a carcinogen that is present in the brewed beverage. Acrylamide is a known carcinogen that is produced naturally during the process of baking or frying some foods. It is produced in coffee beans when they are roasted, and is prevalent in brewed cups. Berle’s ruling, which was reported by the Associated Press, noted that neither side disputed that acrylamide is present in coffee. The case was filed nearly eight years ago; Berle’s ruling is tentative, but is unlikely to be reversed. The third phase of the trial will determine the civil penalties that coffee companies are liable for. The complaint filed by the nonprofit in the coffee case argues that a 12-ounce serving of coffee contains a statistically significant level of acrylamide. What is to be believed and what is to be followed ?